Home / Blog / A healthy investment in our future. Feed More’s Kids Cafe is just one of our programs that help ensure children receive the nutrition they need to learn, grow and most importantly, thrive. With one in six kids struggling with hunger in Central Virginia, the need is great and through our programs, we work hard to make sure we’re meeting it all year long. Every weekday, schools and other community organizations throughout our service area host after-school programs. Kids participate in activities that include cultural enrichment, tutoring, sports and other social activities and creative adventures. Feed More provides these children with a delicious and nutritious meal before they head home through these programs. Our Community Kitchen prepares more than 1,500 made-from-scratch meals each weekday for the Kids Cafe program. Everything from turkey salad to cheeseburgers and fresh fruit, kids love the wide variety and yummy flavors. The meals are then packed up and delivered to our more than 60 sites by one of our many wonderful truck drivers. “Our kitchen follows a well-balanced meal plan that focuses on not only nutrition, but also quality ingredients and delicious flavors that we know kids love,” shares Antjuan Fisher, Executive Chef and Food Production Manager at Feed More. 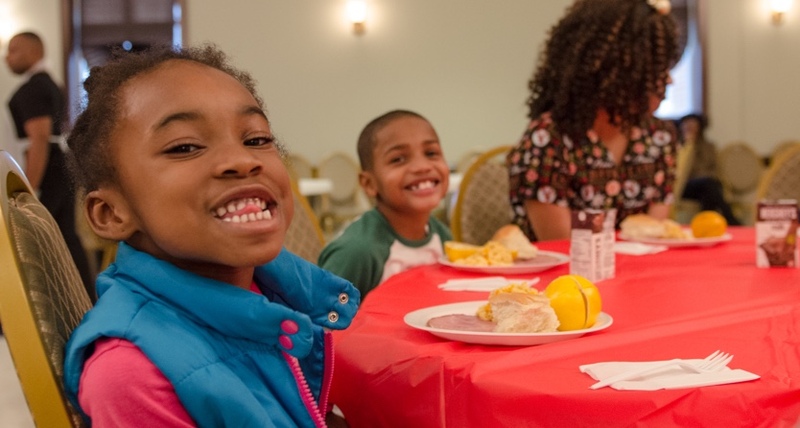 Kids can be kids when they’re not worried about their next meal, and our Kids Cafe program is just one of the ways we can help keep smiles on their faces.